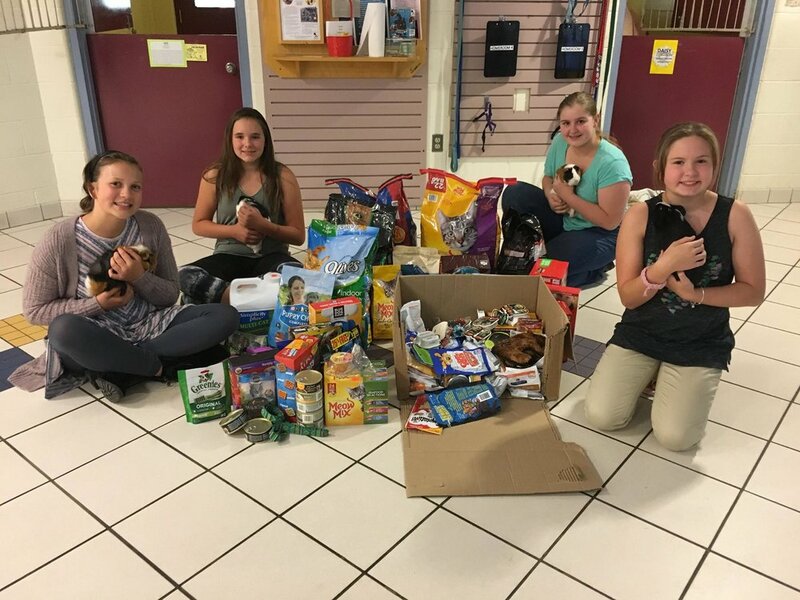 In September, seventh graders, Kelly Williams, Darien Murphy, Raven Groblewski, Maya Anton and Ella Weinmann organized a successful student initiated fundraiser called Hearts for Hurricanes. Several weeks into the school year, JRMS teachers Michelle Durand and James Norby shared with their new team of students the devastation caused by the late summer hurricanes. Both teachers reinforced the benefits of reaching out to communities and the student organizers were immediately compelled to take action by quickly drafting a fundraiser letter of proposal to Principal Clark.The day after the administration team received the letter, students met with Principal Clark and Assistant Principal Lisa Wilkinson to finalize the fundraiser details. 7th graders Ella Weinmann, Darien Murphy, Kelly Williams and Raven Groblewski delivered donations from JRMS Week of Giving! The four students toured the Monadnock Humane Society and made a few furry friends along the way. The Hearts for Hurricanes Dance on September 22nd was the capstone of the successful fundraising week. Kelly enthusiastically stated, “It was the most successful dance that we have ever had.” Students estimated that the dance portion of the fundraiser earned over $700.The dance featured student donated disco lights, streamers, ping pong tables, and, of course, great music like the Cupid Shuffle.Teachers supported this event by helping set-up, clean-up, chaperoning and providing baked goods. Food offerings were a hit, including Mrs. Twombly’s popcorn, donated snacks and baked goods. In total, the Hearts for Hurricanes’ Week of Giving raised $1,003. On so many levels, it was the most successful fundraiser in JRMS history! The funds raised went to assist both people and animals afflicted by the late summer hurricanes. When the young ladies were asked if “what they did inspired others?” Raven replied, “I received a text message from a student that said, ‘I just wanted to let you know that the people you are helping are extremely grateful. You all have big hearts.’” Maya commented on how even though some people were busy and did not have time to plan events, they found ways to contribute through donations and money. According to Kelly, Darien, Raven, Maya and Ella, the week was challenging, yet rewarding especially when their hearts were in it to make a positive change for many.